Alamo City Gold 3 Dimensional 1" Sterling Silver Police Badge Charm FREE SHIPPING! Looking for police gifts? 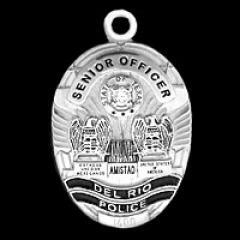 These masterfully crafted replica police badge charms are perfectly detailed to capture the exact look and feel of your full size police badge. Each police badge charm measures roughly 1" in height and comes complete, ready to be worn on your favorite chain. Include your badge number and we will build it right into your new police badge charm! Badge not in our list? We can custom make it for you. Select "Custom Badge" and email us a image of your badge. ©2002-2019 CopsPlus.com: Alamo City Gold 3 Dimensional 1" Sterling Silver Police Badge Charm FREE SHIPPING!